Matthew Sweet wrote one of the great alt-rock albums, and one of the best breakup song cycles, in 1991’s now-classic Girlfriend. Now the LP has become the basis for an unlikely jukebox musical playing through Aug. 9 at L.A.’s Kirk Douglas Theatre. 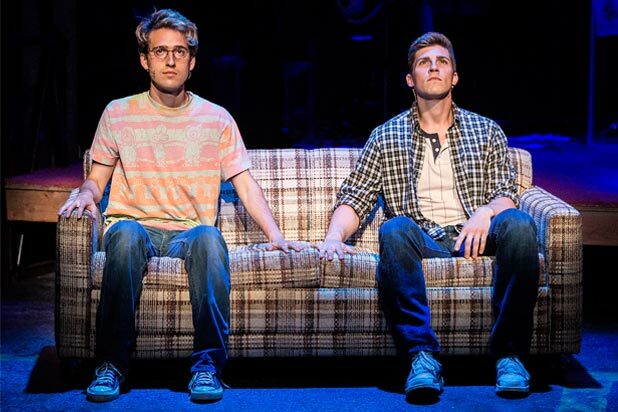 Playwright Todd Almond has kept the timeframe (early ’90s) and the setting (Sweet’s native Nebraska), but reconceived the material to work around a bittersweet and poignant love story between two seemingly mismatched teenage boys just out of high school. It’s a curious production in many ways, but a satisfying one. In which case, Dad may well be surprised to see how Sweet’s classic 1991 album has become the basis for a bittersweet and winsome love story between two Midwestern boys who’ve just graduated from high school. The witty and well-observed book, by Todd Almond, depicts with heartfelt poignancy the tentative, shuffle-step nature of gay teen romance circa-1990. Will (Ryder Bach) is the obvious outcast of the pair, with his oversize T-shirt, the streak of dyed hair flopping over his forehead and his penchant for musicals. “I already feel like I’m in ‘Grease’ — the movie, not the country,” he says at one point.